The ez-gSEAL 100B pressure controller is designed mainly for automated patch clamping, but it can also be used for many other applications. With the ez-gSEAL pressure control patch clamping becomes as easy as a click of a button. You may use it with our ezPATCH 100A smart manipulator, PatchMAX 100A automated patch clamp system, ChannelMAX 100A Mini automated dual clamp system or ChannelMAX 100A Twin automated quad clamp system for fully automated patch clamp experiments, or use it as a stand-alone product on a traditional rig. You may also use the controller for puffing drugs or studying stretch channels. The software-controlled pressure controller comes with pumps so air tanks are not required. Compared to the previous model, the ez-gSEAL 100A pressure controller, the 100B has many improvements: the pumps are more powerful and have longer lifetimes, there is improved airflow in the unit for better performance, and the unit comes with a pressure gauge to help users determine the pressure used for making seals and breaking in. The ez-gSEAL control software, the NBSController, controls the pressure application and measures the pressure. The pressures that are commonly used can be pre-set so users can click a few buttons to make seals and break-in. iPod Touch Control – New! The ez-gSEAL pressure controller can be controlled by iPod Touch, iPhone or iPad. The iPod Touch connects to the server software, the NBSController, through WiFi so you may use the iPod Touch as a remote control to control the device from your set up. 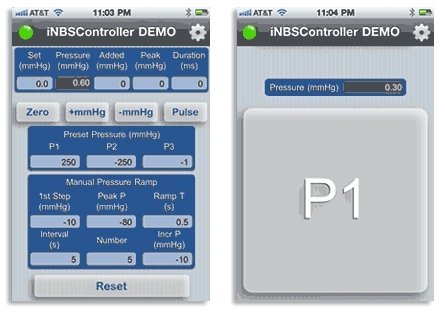 The iNBSController is designed so that it can change the values easily as the NBSController. In addition, the pre-saved parameters for makind seals and breaking-in are played in a sequence so that users can press the button they need without looking. This i particularly useful if you have to adjust focus with one hand and control a manipulator with the other hand while trying to generate suction to make a seal. The iPod Touch or iPhone can be right next to your hand and you can use one little finger or elbow to touch the screen to trigger the pulse. The ez-gSEAL pressure controller makes patch clamping easy. Complicated patch clamp experiments become as simple as a few button clicks. You click the first button to set the positive pressure, the second button to set negative pressure for making seals, and the third button to set the holding pressure. By clicking a single button, you apply pulses to break into the cell. The ez-gSEAL control software measurement function helps you measure the pressure yo use for making seals and breaking in. In addition, many types of cells and tissues, such a HEK293 cells, brain slice and oocytes, have been tested and seal parameters are availabl for them. New users can usually use these parameters to make seals and break in the firs time they try. Please contact NeoBiosystems for available seal parameters. With the addition of a DAQ board from National Instruments and our BNC interface box, making seals and breaking in is as simple as one button click. When it is used with the ezPATCH 100A manipulator, all you need to do is to aim the patc pipette at the cell you want to patch. After you click a button, it will touch the cell and ma seal, or even go whole cell automatically. With the ez-gSEAL pressure controller, you can set a very small holding pressure during experiments so that the seals last a long time. Patch clamp experiments become precise and reproducible. When you use a syrin or mouth suction to break into cells, it is usually very difficult to control the pressur When you use the ez-gSEAL pressure controller, you can define the suction pressure and duration for break-in. The results are consistent and reliable. It is very rare that the membrane reseals after breaking in, but if it happens, you can apply more suction without touching the rig. It ’s easy and stress free. Instead of tensely controlling the pressure yourself, you only need to click a few buttons for making seals and breaking in. This takes away the stress from you so that you can be more productive in a day. Training time is shorter. So far, even students with little experience in patch clamping can make seals with our parameters. It’s easy for trouble-shooting. When the success rate of making seals suddenly becomes low, you will not need to spend endless efforts trying to improve your sea skills, but instead focus on the possible real reasons such as cell conditions, solutions or patch pipettes. The skill is good forever. Most patch clampers experienced that after you stop doin experiments for a while, you lose your skills. With the ez-gSEAL, you can easily reach your normal seal success rate as long as you record your seal parameters. High success rate. The success rate to make seals and break in is at least as goo as traditional methods, if not better. The auto-seal algorithm is similar to what is used in the PatchXpress® automated patch-clamp system. PatchXpress users can use it to test their seal parameters under a microscope for easier trouble shooting and lower costs. The ez-gSEAL pressure controller can be used for pressure clamping for stretch channel study. The pressure sensitivity is 1.5 mmHg and the pressure range is from -250 mmHg t 250 mmHg. It is good enough for most stretch channels. The ez-gSEAL pressure controller can also be used for local drug application. 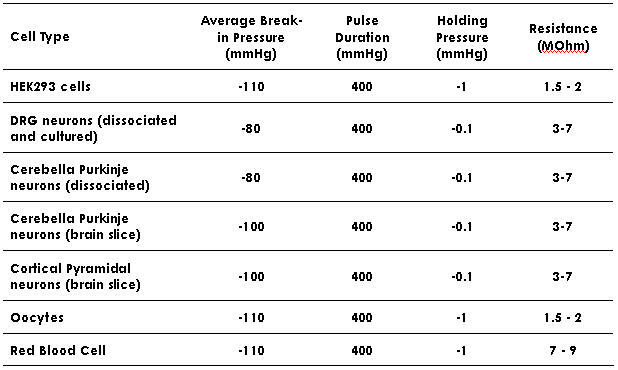 A series of pressure pulses can be given at defined pressures for defined durations. Recording obtained at the Marine Biological Laboratory using the ez-gSEAL 100 pressure controller. LNV clock neurons in female Drosophila were used for electrophysiological recordings. A 6-7 micrometer diameter pipette filled with protease XIV was first used to digest the tissue above the clock neurons. 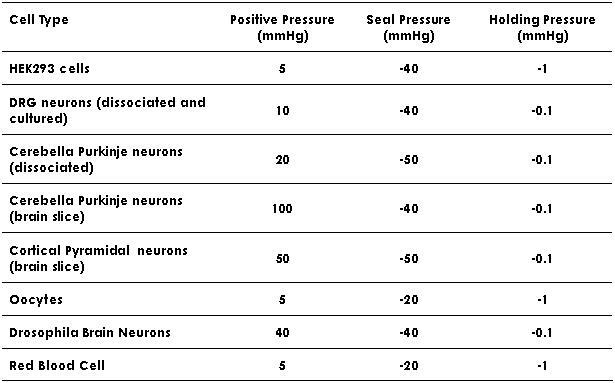 The pressure setting for applying the protease XIV was 20 – 30 mmHg. When making the seal, 40 mmHg pressure was applied during the time the patch pipette (polished. Resistance ~ 17 MOhms) approached the neuron, and then -20 mmHg suction was applied to make the seal. The breaking-in pressure for this cell was -200 to -250 mmHg for 0.5 s. The holding pressure was – 1 mmHg to keep the seal stable during the recording. This recording was obtained 3.5 hours after making the seal, and the cell was still healthy. Dr. Guan Cao, University of Texas; Dr. Michael Nitaback, Yale University. Suspension of HEK cells expressing ClC-0/C212S chloride channels. When making the seal, 5 mmHg pressure was applied during the time the patch pipette (Resistance ~ 2 MOhms) approached the cell, and then -40 mmHg suction was applied to make the seal. Obtained from Dr. Xiaodong Zhang and Dr. Tsung-Yu Chen, University of California, Davis. The tables below include making seal and breaking in parameters when using the ez-gSE 100A Pressure Controller . From our experience, most labs can make seals easily with the parameters we provide. Break-in parameters may vary somewhat, as the break-in pressure heavily depends on the tip size of the patch pipette. The larger the opening is, the smaller the break-in pressure is required. Making seal parameters for different cell types. Break-in parameters for different cell types. Since the required break-in pressure is depended on the tip size of the patch pipette, the resistances of the pipettes are included.